Results of the Bet365 Cup - Final Ranking! After 4 exclusive tournaments for RKH members, here are the winners of the RKH Cup on Bet365. With a 3rd, a 7th, a 9th and a 2nd place and a total of 880 points, the winner is @diemonn! Congratulations, you win €300 to play on Bet365! 2nd: @Marius Cristian who wins €200! 3rd: @BI65l1CK75 who wins €100! Congratulations to you all and thank you for participating! See you soon on RKH and Bet365! Cool prices, have to make an account there finally. Cool Cup, as usual! gg all! Great games, it was fun. Will the money be in tourney dollars or cash in the account ? so when do we get our winnings into our accounts anyone know??? @blucky111 I've contacted them yesterday. You should receive thе tickets in the next few days. I'll keep you informed. Everyone first because you got so much free cash! second if you speak to the live chat they will probabally get someone to change them for you. 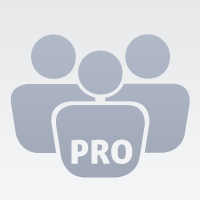 Live support seemed very good when i spoke to them a few weeks ago about the best I've experienced from a poker site. You have been very patient waiting for these results. Thank you! So, to make you forgive us, we decided to reward EVERY CONTESTANT in this mission. Congratulations, you win 1h of coaching by our pro ambassador, with almost $2,000,000 career earnings, @Nicolas Levi! A KISS by the beautiful Elena! As announced above, everyone’s a winner in this mission! You all win a 2€ tickets on Bet365! We hope this will be the starting point of a big bankroll for you. Thank you all for your participation! We hope to see you soon on Bet365! Thank You and congratulations advoghado! wow congratulations @advoghado great prize! time for #GiveAGuess mission pt.6 -> here ! Great! I just have one thing to say: Thank you! Check the current ranking in the Leaderboard here. 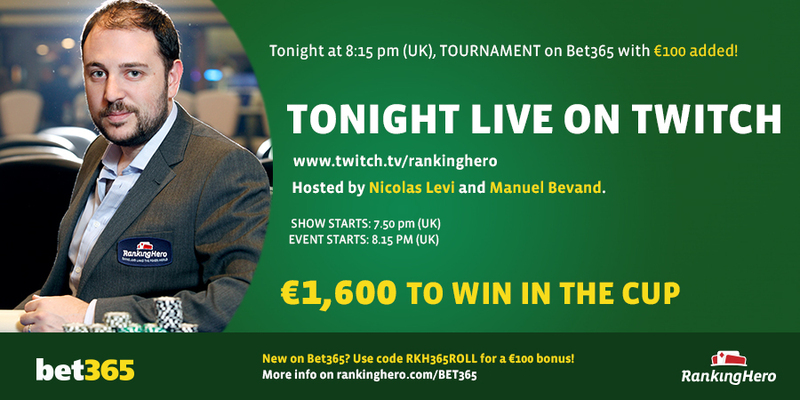 Don’t miss the last event of the Bet365 CUP “RKH-KILLEM”, starting at 8:15pm with €100 added! This time the password will be revealed during the live Twitch show hosted by Nicolas Levi on the RankingHero channel. So make sure you tune in at 7:50 pm! It’s your last chance to earn points for the RKH Leaderboard and win your share of the €1,000 distributed at the end of the Cup! In tonight’s tournament, the points will be tripled! If you don’t have an account yet, click here and enter the promo code RKH365ROLL! More info about the Cup HERE. somebody can send my the password plz by email? how and when can i see in the bet365 lobby the RKH tourney? Mission #OMG365 - Win 1H of coaching and lots of tickets! 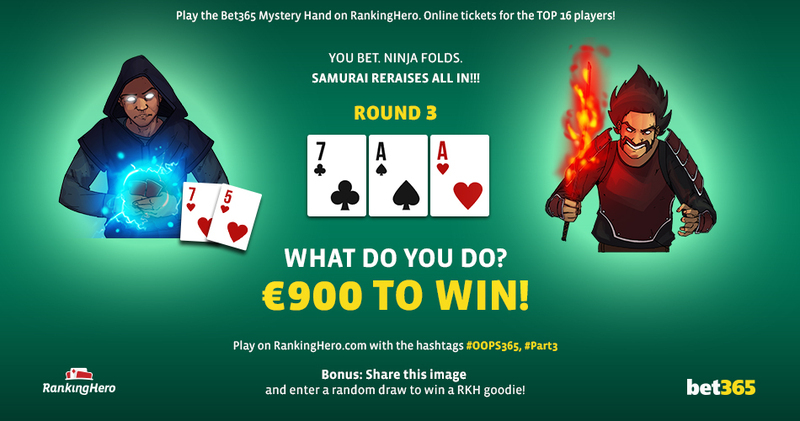 Here is the 2nd mission of the Bet365 festival on RankingHero! After a strategic mystery hand last week, this one is all about fun! 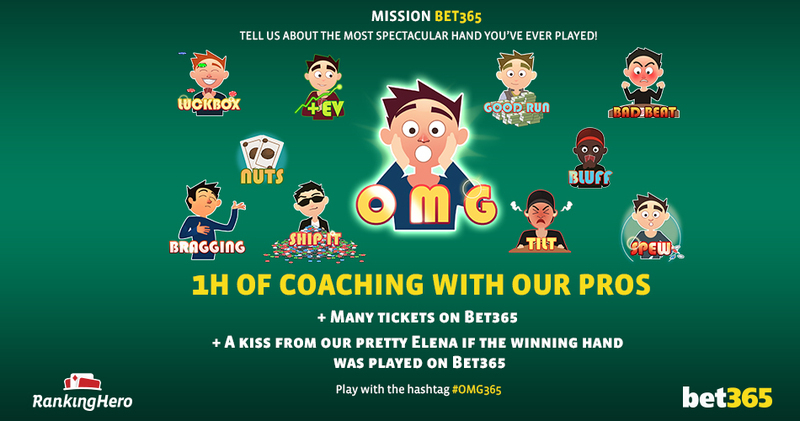 In this mission, tell us about the most spectacular hand you’ve ever played, if possible on Bet365 (with a special added gift in that case ), with the hashtag #OMG365. You can choose any hand you’ve really played as long as it’s an impressive one! And no need to get likes to win the main prize! Winner designated by our jury => 1h of coaching by our pro ambassador, with almost $2,000,000 career earnings, @Nicolas Levi! 5 most liked posts => €2 tickets on Bet365! 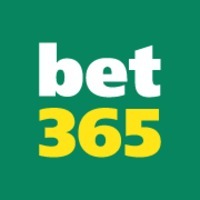 Several random draws => €2 tickets on Bet365! And if you win the mission with a HAND PLAYED ON Bet365, you’ll receive a kiss from our pretty @Elena RKH! You have until June 16th to tell us this story in a nice-looking post with the hashtag #OMG365. Remember: Next Monday, €3 tournament on Bet365. Thanks, @Elena RKH I'm trying to get a good hand, but the poker rooms do not like me. Now it’s time to play the new mission where we ask you to tell us about the most spectacular hand you’ve ever played, if possible on Bet365 (with a special added gift in that case ), with the hashtag #OMG365. As promised, here is the new mission ! Tonight Bounty tournament with €100 added! Tonight, at 8:15 pm (UK Time), bust as many people as you can in our multi-bounty tounament counting for the RKH Bet365 Cup. €1,500 up for grabs in this Cup. €1 bounty on every player! The Leaderboard has €1,000 to share! Find more details and the schedule here. 1. Enter your PokerNickname in the green box on the top left of this page. 2. Passwords will be sent by private massage on RankingHero 30 minutes before each tournament. Join the Leaderboard to get your share of the €1,000 distributed at the end of the Cup! RankingHero ambassadors and pro players @Nicolas Levi and @Pedro Canali at 7:50 on the RankingHero Twitch channel. They will comment the tournament, talk strategy, answer your questions and, as usual, organize some fun mini-games to give away RKH goodies! Don’t miss that and Join on http://www.twitch.tv/rankinghero. If you've connected your account it will be in your inbox, if any issue tell us on the twitch show! Im not supposed to have good results in this series. At first freeroll it was almost the same. Thank you all for playing! The mission is now over. But brace yourselves because tonight, there is a TOURNAMENT and a Twitch talk show! @Santo Abate, @Skilful, @John Harley, @B165L1Ck75 and @Bnasp. We said 16 players would get tickets, but finally, we will reward 18 members! So stay tuned and come back soon to see the results! Please note that the hashtags have changed. Here is the second part of the mission #OOPS365! Still €900 up for grabs. Enjoy! You are at the Venetian, Macao. You’re surrounded by rich and rather unfunny Chinese businessmen. And honestly, it’s a bit scary. What a relief when you suddenly catch a glimpse of a familiar face across the room: your friend, Ray. You don’t pay attention to the dealer giving you the cards while you’re on the Button. You don’t even follow the action when a ninja in early position opens 3 BB. A samurai in middle position calls. You just shout “Hey Ray!” to your friend. “Raise, how much Sir?” says the dealer with a strong Chinese accent. You try to explain that no, you didn’t raise. You were just calling a friend… but you realize that the ninja and the samuraï are staring at you, with a sardonic smile. The dealer looks at them, then at you: “You said you raise. Too late Sir” he says, looking sorry for you. You look at your cards and see 7♥5♥. You have no choice. You must bet. The ninja does a few chip tricks, and before you know it, he reraises to 18BB. The samurai calls, and so do you. Both of your opponents check. The pot is now 55BB. You have 78BB left. Ninja folds and disappears in a cloud of smoke. Samurai stares at you. Then with a huge smile he pushes all his chips in the middle. Now you DO have a choice: fold or put all of your stack in. Answer IN A NEW POST (not in comments ) with the hashtags #OOPS365 and #Part3.You have until Monday morning to answer! When is winner being announced? 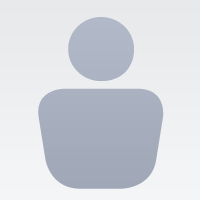 @Jainesh Patel please post your comment on your RankingHero profile to participate in the mission. Please notice that the hashtags have changed. Answer IN A NEW POST (not in comments ) with the hashtags #OOPS365 and #part2. The next step will be revealed Friday afternoon! First of all your an idiot for raising 9BB and then the nija is a bigger idiot for min raising, but the samurai has it all with 9s in the hole . So, as for the hand you check,because only an idiot bets out with that board against 2 callers with or without an ace.